Our mission is to develop new knowledge of Earth’s history as a planet, its environment, and resources; engage our students in the process; and share that knowledge broadly. We use scientific methods to study the physical processes that shape our planet. We have two areas of special focus: water and earth. In both areas, we analyze how earth materials such as water, minerals, sediments and rocks, and energy move and change. These are the dynamic processes that distribute critical resources and form landscapes. In the area of water science, we focus on the water cycle. We study glaciers and ice sheets and how they move and flow and impact climate, groundwater systems and interactions with surface water, and rivers and their relationship to the landscape. For more details, please see the water research pages. In the area of solid earth science, we focus on the outermost rocky layer of the planet, the lithosphere. 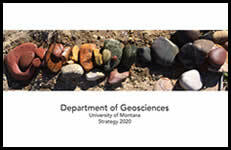 We study its rocks and minerals, how it has moved and rearranged itself through time, the record of erosion and deposition, the evolution of life, and present-day hazards such as earthquakes and volcanoes. For more details, please see the solid earth research pages. Large Explosive Eruptions: How Long Does it Take for Magma to Reach the Surface? The mechanisms and timescales associated with the triggering of caldera-forming eruptions remain ambiguous and poorly constrained. Specifically, we lack methods for assessing the processes that initially drive magma from their long-term storage region into the conduit(s), and what controls the residence time of magma ascending from the storage region to the surface. To access these rates, we apply two diffusion-based methods to quartz grains taken from the initial fall stratigraphy from four caldera-forming eruptions (including Yellowstone) that show field evidence for contrasting opening behavior.